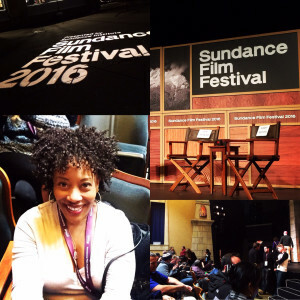 Documentaries and Diversity were the theme of the 2016 Sundance Day One Press Conference. With a panel consisting of President and Founder - Robert Redford, Executive Director - Keri Putnam, Sundance Film Festival and Sundance Film Festival Director - John Cooper moderated by Sean P. Means, Movie Critic and Columnist for the Salt Lake Tribune. All three panelists agreed that Sundance is always about lending a place for those filmmakers who otherwise would not be heard on a fair playing field. Putnam made a special reference to Sundance Ignite, as program geared toward 300 youth between 18-25 years of age designed to give these youth an opportunity to attend the festival and aid in continuing to build festival for future generations. Putnam also mentioned the Sundance Institute's Women in Film Initiative meeting held this past November. She stated, "We're interested in the artists we work with having sustainable careers". Notable filmmakers such as Ava DuVernay and Ryan Coogler have been products of how Sundance builds sustainable careers. When faced with the all too often discussed "diversity " question, Redford told the crowd, "We wanna put a spotlight on areas that aren't getting attention...I felt there wasn't enough filmmaking being shown for African-Americans and women...so we've moved forward with getting more support for women and young filmmakers but using the word diversity to push it". Worried that the media would spin an answer he gave when asked about the diversity of the Oscars, Redford simply stated, "I'm not focused on the Oscars, but more focused on the work". He also wanted to clear up the misconception of his disdain for Hollywood, "I'm not against the mainstream...we wanted Sundance to create a path for artist to showcase their work and for audiences to come to Utah to see the stuff they couldn't watch in the general market place". In addition to supporting diversity, youth and women, the festival is also celebrating the 10th anniversary of its New Frontier Program. Along those lines, with films and television shows live streaming in tandem with a theatrical release I personally asked if they thought streaming would take the place of how films are being seen, Putnam told me that "Sundance does not pass judgement on how filmmakers chose to show their films and that it is all very "platform agnostic". While technology has created very useful and creative methods in making films exciting for the viewing audience, Redford is concerned about the art of losing the story in all the frills. "The most important thing is the story ... What is the story you want to tell"? Well, the story has yet to unfold here at Sundance 2016, who received a record number off 12,793 film submissions narrowed down to 195 feature and short selections, 30 documentary and narrative virtual reality works and 56 panels and music events. Stay tuned here for Day Two when I will be talking about some events sponsored by TheBlackhouseFoundation.org who are also celebrating 10 years of Sundanc, not to mention some really awesome docs that I can't wait to discuss! !